Alongside classic American counter food like hamburgers and chicken wings, Pasadena’s Spudds serves up almost a dozen different styles of poutine. Each of these variations, including Mexican, Philly cheesesteak and corndog, are built off of the classic accoutrements—chicken gravy and a generous covering of small-sized cheese curds. Regardless of additional toppings, the freshly-fried, hand cut french fries are the star of the dish, appropriate considering the name of the operation. (Following through with the eponymous tuber, Spudds also puts together a variety of baked potatoes.) 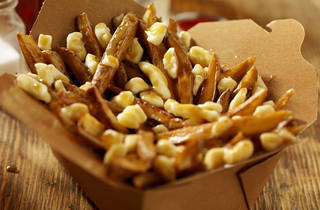 Unique among poutine restaurants, Spudds serves a sweet version of the savory standby using sweet potatoes covered by the traditional gravy and cheese curds.